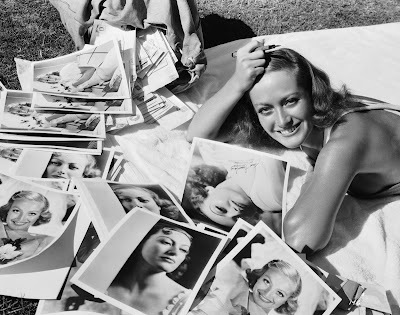 Today's star is Old Hollywood legend Joan Crawford. 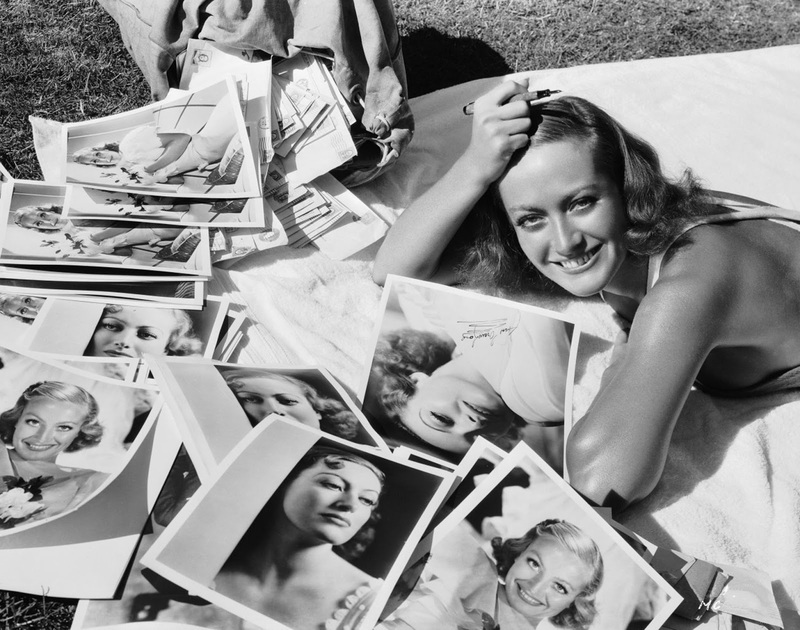 TCM is celebrating the career of Joan Crawford with 13 movies on Aug. 10. Here's what you need to know about one of the greatest movie stars of all time. FYI: TCM sometimes changes the air times and /or movies, so you can go to www.tcm.com to check the updated schedule. Born: March 23, 1904, in San Antonio, Texas (Note: there's quite a bit of disagreement over Crawford's birth year, so I'm going with TCM's date). Died: May 10, 1977, in New York City. She is buried in Ferncliff Cemetery and Mausoleum in Hartsdale, N.Y.
AKA: Crawford's real name was Lucille LeSueur, but MGM publicity chief Pete Smith disliked that name because LeSueur reminded him of "sewer." A name that star contest was held in Movie Weekly magazine although MGM did alter the fans' choice of Joan Arden to Joan Crawford. Academy Awards: Crawford won a best actress Oscar for Mildred Pierce (1945). She was nominated two more times for best actress for Possessed (1947) and Sudden Fear (1952). Brief bio: Crawford grew up in difficult circumstances in Texas. Her parents separated when she was young, and her father was a poor laundry laborer. Crawford worked a series of menial jobs as a teenager, but she used her talent for dancing as a ticket out of poverty. Crawford won a series of dance contests and she eventually landed in chorus lines on Broadway. Crawford headed to Hollywood in 1925. She mostly played showgirls for a few years, but she landed her big break as a wild flapper in Our Dancing Daughters (1928). Crawford became one of the biggest stars on the MGM lot during the 1930's appearing in a series of melodramas that earned her a loyal fan base. Her career faded somewhat in the 1940's, but she made a spectacular comeback in the classic film noir Mildred Pierce. Crawford found personal happiness when she married Pepsi CEO Al Steele in 1955, but she continued to work steadily in films, including the horror classic What Ever Happened to Baby Jane? (1962). Crawford retired in 1970 and she passed away in 1977 from a variety of ailments. 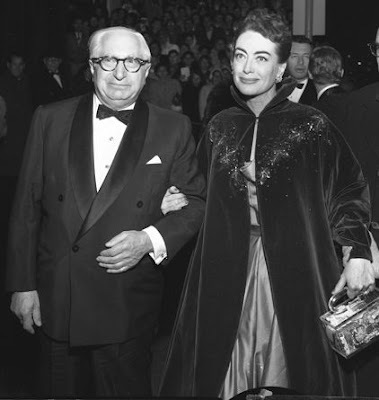 Former MGM chief Louis B. Mayer and Joan Crawford in 1953. Fun fact: Crawford personally responded to fan mail and autograph requests. Signature role: A spurned housewife who builds a chicken and waffles empire in Mildred Pierce. 1. TCM is airing three great precode Crawford films. My pick is Forsaking All Others (1934), airing at 2 p.m. Crawford appears with frequent co-stars Clark Gable and Robert Montgomery in a soapy love triangle. 2. The Women (1939), airing at 3:30 p.m., is a fun, frothy all-star comedy about love and marriage from a female perspective (the film has no male cast members). Crawford steals the show as a department store employee who is out to steal Norma Shearer's husband. 3.Whatever Happened to Baby Jane, airing at 1:45 a.m., is a showcase for Bette Davis' considerable talents, but Crawford is also great as a wheelchair bound movie star who is tormented by her jealous sister. A great film not featured on Summer Under the Stars: There are about a dozen great Crawford films I could recommend, but I'm going to assume you've seen Mildred Pierce and Grand Hotel (and if you haven't what are you waiting for) and go with Mannequin (1937), a first rate soap opera directed by Frank Borzage and co-starring Spencer Tracy and Robert Montgomery Alan Curtis. Crawford plays a working class girl who falls in love with the wrong man. 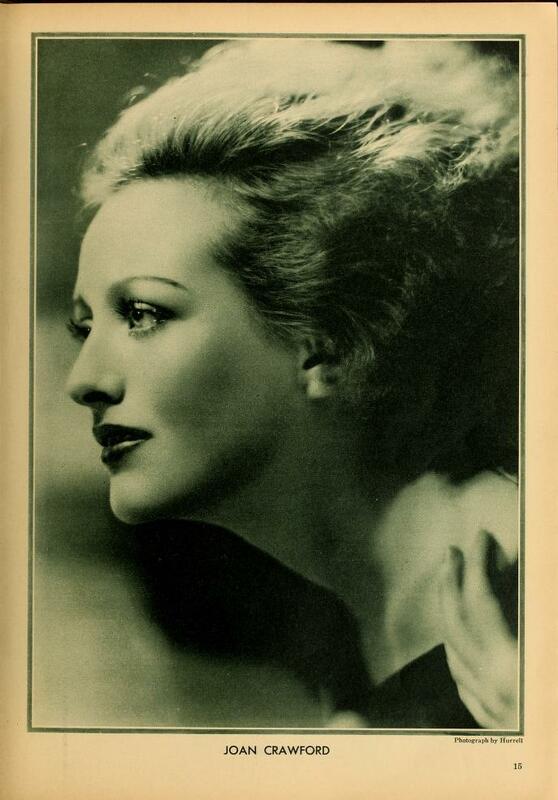 Fan Magazine Flashback: A striking 1930 portrait of Crawford from New Movie Magazine. Courtesy of the Media History Digital Library. Old Hollywood video: A tribute to Crawford from her Mildred Pierce co-star Ann Blyth. An in-depth look at The Women. A look at the film noir elements of Mildred Pierce. For more Summer Under the Stars articles, go here. There'll be plenty more on Crawford on social media. Follow me on Tumblr, Google+ or Pinterest or like us on Facebook. Follow us on Twitter @oldhollywood21.